At first, the vigorously shaking crocodiles are given an electric shock; their necks are then cut open and metal rods are rammed down their spines while they're still alive, making the crocodile bleed out. The poor reptiles are skinned while still bleeding and moving. Crocodiles in Vietnam are skinned alive to make “luxury” leather bags, belts, and watchstraps for the world's leading fashion brands – including Louis Vuitton – a horrifying undercover investigation has revealed. Crocodiles were also filmed lying motionless in tiny concrete cells, some narrower than their own bodies. Others were found jam-packed by the dozens into barren concrete pits. At first, the vigorously shaking crocodiles are given an electric shock; their necks are then cut open and metal rods are rammed down their spines while they're still alive, making the crocodile bleed out. 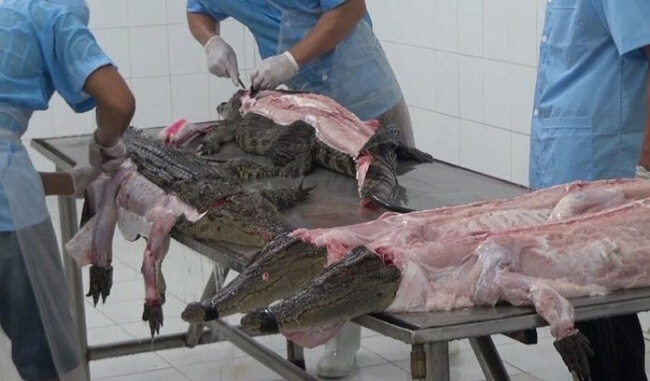 The poor reptiles are skinned while still bleeding and moving — a process that takes 15 to 20 minutes; the crocodiles remain conscious for over an hour after their spinal cord has been severed and their blood vessels cut. Can you help stop this cruelty? Can you stop buying products made from animal skins? Can you make sure you don't end up with skeletons in your cupboards? Can you urge fashion brands to shed using exotic skins?